From left are NCHS head coach Nikki Jones, LHSAA Hall of Fame Coach Emma Boozman and Meredith Graf. 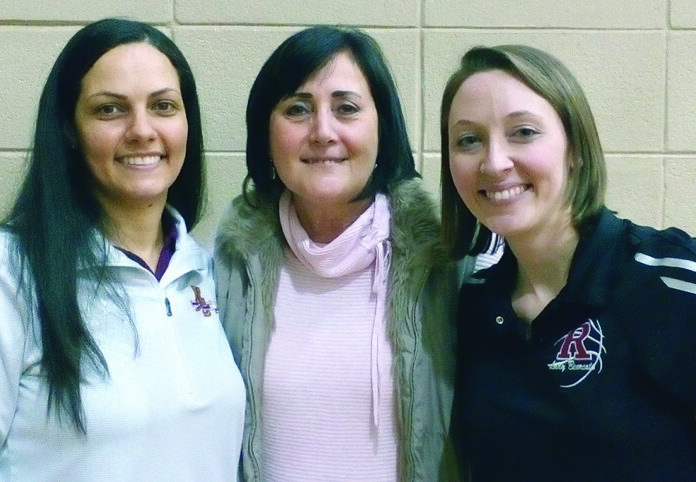 Natchitoches Central’s legendary girls’ basketball coach, Emma Boozman, was on hand to watch two of her former players, Nikki Jones, NCHS head coach, and Jenna Bolin, head coach of the Ruston Bearkats. These ladies have taken the torch from Coach Boozman and are continuing to run that long marathon with it. “While coaching these two, they were so engaged in what we were trying to do. Both Jenna and Nikki were coaches on the court. I could trust them to make the right adjustments if the opposing team changed what they were doing. I tell you the truth, I count this achievement just as high as winning state championships. The fact that two of my former players have taken on the responsibility of helping shape and mold young ladies to be successful in life really means a lot to me.” Boozman said.